2012 Hyundai i30 and Kia Cee'd compared | What Car? Prices for the 2012 Kia Cee'd have been announced, with the entry-level model starting at 14,395. The all-new Cee'd is closely related to the 2012 Hyundai i30, which went on sale in March. These Korean hatchbacks share much under the skin, but each has its own distinctive look, and their prices and specification differ. Here's our breakdown of each range, to help you choose between the two. Prices for the Hyundai i30 start from 14,500. The cheapest Cee'd is 205 cheaper at 14,395. Both entry-level models have a 98bhp 1.4-litre petrol engine. The cheapest diesel version of each has an 89bhp 1.4-litre diesel engine. 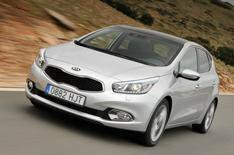 Kia Cee'd diesel models start from 15,695, whereas the cheapest diesel-powered i30 is 16,145. The most popular engine in each range is likely to be a 1.6-litre diesel. Hyundai offers two versions, with either 109- or 126bhp: both have 192lb ft of torque. Kia offers the 126bhp version only. In entry-level trim, the Kia Cee'd 1.6 CRDi 126 costs 16,295; 600 less than the 109bhp i30 1.6 CRDi. Prices for the Kia rise to 23,795 for the 1.6 GDI DCT 4 Tech. The 1.6 CRDi Blue Drive Style Nav tops the i30 range at 20,295.